Are you ready to get found? We can help you optimize your site for Google. Have us help you design and setup your social media pages. Have your blog articles automatically become a stylized email blast. Want a custom landing page? Build out the perfect page for your campaign. Get more reviews on the sites that matter to you! Our mortgage blog content service provides you with weekly content to add to your mortgage website. Get a beautiful introduction video made for your website and social media platforms. Have questions or want to see more? Request a demo of our Mortgage Websites! We are a young company, we have a lot of drive, and we will never stop working on improving old features and adding new ones! We want our clients to be extremely proud of their websites. 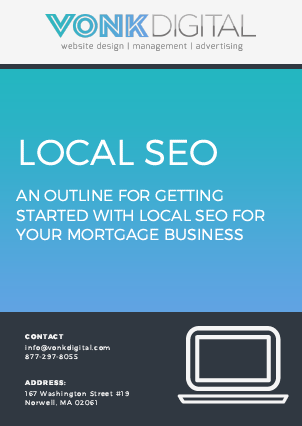 An outline for getting started with local SEO for your mortgage business. We list 12 actions you should take if you want your website to rank better in local search. Great! Enter your information and we will email you a copy. Send me the SEO Guide! Thank you, it is on the way! Check your email shortly.